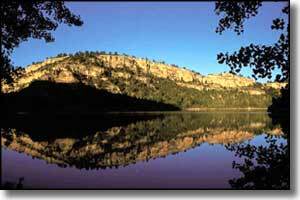 Guernsey State Park is based around the Guernsey Reservoir on the North Platte River in east-central Wyoming. The Park offers seven campgrounds, five of which are around the lake. The campgrounds all include drinking water, rest rooms, picnic tables and fire grills. Special attractions at Guernsey State Park are the Guernsey Museum, the Castle and Brimmer Point. The buildings were built of hand-hewn timbers and hand-forged iron by the Civilian Conservation Corps in the 1930's. The Museum is perched on a high cliff, overlooking the lake. The Castle has a giant fireplace and winding stone steps leading to an observation area with a spectacular view of the state park. Brimmer Point is at the center of ten miles of moderately strenuous hiking trails. 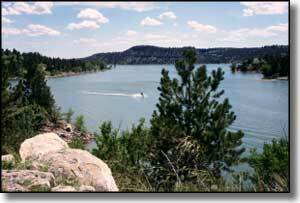 The trails are laid out in loops that offer many different scenic views of the dam, the reservoir and the state park. This area of Wyoming was crossed by the 1841-1869 era Oregon Trail, a wagon route used by thousands of immigrants migrating westward across the plains. Half a mile south of the town of Guernsey is an area known as "the ruts," where remnants of the trail are still visible in plain sight. There's a half-mile stretch here where the wagon wheels, people and draft animals wore a wide groove between 2 and 6 feet deep into the sandstone ridge. Two miles southeast of Guernsey is Register Cliff, a natural "chalkboard" still showing many of the names written on the rock by pioneers as they marked their journeys westward. As Register Cliff was a good day's journey from the safety of Fort Laramie, many of those early pioneers camped here for the night. A small trading post was located near the cliff that became a Pony Express stop in 1861 and a regular stage station later. 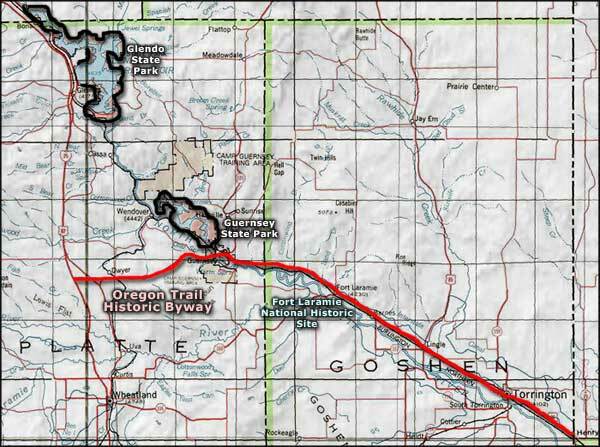 All these places can be found and visited by driving the Oregon Trail Historic Byway through this part of Wyoming. Guernsey State park can be reached via the I-25 to exit 92, then east on US 26 to State Road 270. Photos of Guernsey State Park Museum and Register Cliff courtesy of the National Park Service.